The previous process to this one, was ‘define activities’ which has its name suggests is there to identify and document all the activities and their relationships that need to be included within the project. The outputs of that process are used as inputs to Sequence Activities, but both of these processes may be done in parallel if this is preferred. By definition, the first activity in a plan has no activities preceding it, and the last activity within a plan has no activities succeeding it. We have yet to add resources to each activity, and so the duration of each activity is not yet known, and what we are doing here is determining the sequence in which the activities need to occur – hence, Sequence Activities. The activity list was designed and created within the define activities process, and it is this list that is now arranged in a logical sequence showing the order in which these activities must be performed, hence sequence activities. 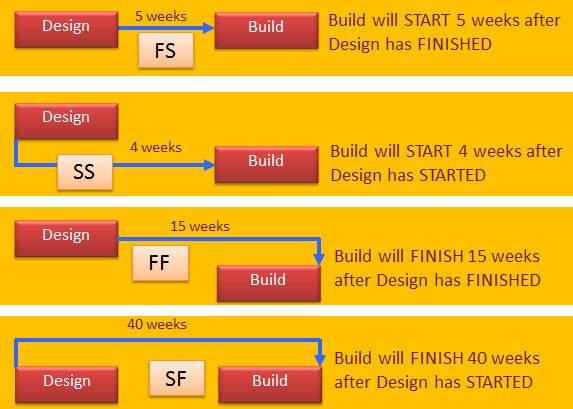 In the real world some activities will have a fixed logical sequence, for example a product must be designed first before it can be built. Some activities may be performed at the same time as others, and hence will have a parallel relationship in terms of time. Activity list. This is the main input to sequence activities at it consists of all known activities to be included within the plan. Activity attribute. These are only needed for large complex projects, and include activity aspects such as detailed description, constraints assumptions, resource requirements, etc. Project scope statement. Having a complete understanding of the project’s scope will give clues as to the most appropriate order ( sequence activities) in which certain activities must be carried out. In addition, by using the project scope statement as an aid to the logical sequence, this will ensure that all of the activities are considered and included. Milestone list. Milestones are zero duration activities, and will often be created as a result of key activities being completed at a particular point in time. They are also used to name and identifying key control points when monitoring and controlling during project execution. Such milestones may influence or impose the sequence of activities and are hence vital to be used here. Organisational process assets. This is a common inputs used for many processes, and in this case may influence activity sequence via either use of similar previous project plans, procurement sequence procedures, or duration estimating data for activities. It is also worth considering using organizational process assets to seek out any information on previous similar projects in terms of the activities used and their relationships to help determine the best way to sequence activities. As an example, let us imagine that in a previous project, two activities may have been done at the same times, but this gave rise to unexpected issues, and the lessons from this previous project were to schedule the activities in sequence. The main output from the sequence activities process is the project schedule network diagram which is normally just called the network diagram. Once this diagram is created, it can be used to refine the activity attributes in sequence activities that were created when using the process defining activities. Sequence activities tools and techniques. Referring to the first sequence activities diagram you will note that there are four tools and techniques, but put simply, the tools and techniques are there to determine the logical relationships and their dependencies, and apply leads and lags if and when necessary. Sequence Activities – Precedence Diagramming Method (PDM). Most of your tasks were used this type of relationship, and it simply means that the must finish first before its successor can start. As an example ‘the water must be boiled before I can add my coffee’. Sequence Activities –Finish to finish (FF). The predecessor activity must finish before the successor activity can finish. An example might be ‘I must finish frying the chicken before cooking the sauce is finished’. Sequence Activities –Start to start (SS). The predecessor activity must start before the successor activity can start. Sequence Activities –Start to finish (SF). This relationship is not used often. The successor activity must start before the predecessor activity can finish. An example would be ‘my new computer must have all personal files and applications transferred and working before I wipe the hard drive on my old PC ready for refurbishment’. Some activity relationships within sequence activities are logically mandatory, while others may be logically discretionary. An example here of a logical mandatory relationship would be that the water must first boil before the coffee can be made. Whereas a discretionary relationship example would be that the user guide and quick start guide documents are both required but the sequence of creation is not important, but I chose to create the user guide first because it is a larger document. The third type of relationship used within the sequence activities process is often a constraint and it is called an External dependency. Such dependencies originate from outside of the project scope and hence control. They therefore must be taken into consideration when developing the activity sequence. An example in an IT type of project could be the development of a new data protocol by a third party, and that this protocol will be used within the design of the project’s product end-product. This is an activity that is performed or occurs outside of the project and its control. Examples here are waiting for a building permit, or for a product to be externally audited before it can be completed. This is a time delay between the predecessor and successor activities. For example, waiting for the concrete plinth to harden before erecting the statue upon it. A Lead is the opposite to the Lag, it is where the successor can start before the predecessor has finished. In effect, both sequence activities overlap in time by some ratio. An example might be to start testing some of the software code before the entire application has been completed. Scheduling network templates. Such templates are normally available from previous similar projects, and if a central project management office exists within the organization, they will keep such templates to assist in the scheduling of activities. These templates may be of a complete previous projects or a particular segment, stage, or phase or work package from such the project. All projects are unique, but many are similar possibly within the methodology used or the design, build, development, test and install sequencing. Want To Pass YOUR PMP Exam First Time? CLICK HERE for my PMP Primer!